Denomination : Silver denier. Mint : Rhodes. Size : 28.0 x 28.6 mm. Weight : 3.91 grams. Reference : Met. 1214 to 16 variety., CCS 25j (page 526). 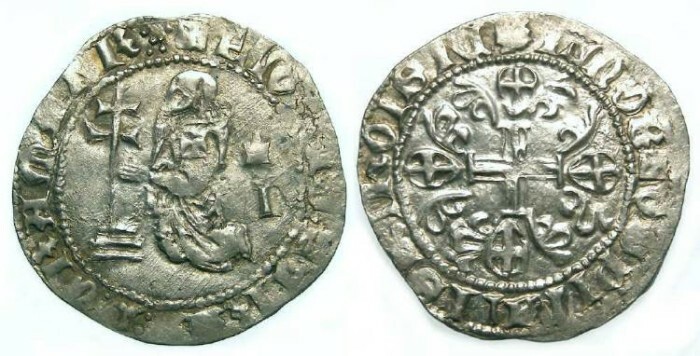 Grade : VF with typical weakness in the inscriptions. Obverse : Grand master kneeling beore a patriarchal cross on steps, with a castle behind and an "I" below the castle. In it's ideal form the inscription around would read, starting at the initial cross at 12 o'clock, FR IOANES FERDINANDI DEI GRA M, but the inscription on this coin is a variation on that, with some different abreviations, some letters llgate, and because of some weak areas I cannot quit work it out exactly.